I am a crafty hoarder....there I said it. There are times when the amount of stuff I hoard really gets to me, it makes me feel anxious, I really don't think I can use all of it, but there's that, what if the stuff I get rid of is the stuff I'm suddenly going to need next week phenomenon. I've just had to order a jigsaw puzzle on ebay that I gave to a second hand shop last July, because the regret of giving it away when I want the chance to complete it, was too much! Last June when we moved house the enormity of the 'crafty stuff' left it's mark. I must get rid of some stuff I decided. I contacted a friend who put my drum carder up for sale in some groups. I'd likely only used the drum carder once in the last 5 years. I don't really find carding fibre very exciting! The first email came, I suddenly realised I would be left with a huge pile of fibre and no carder to card it with. I explained to the nice lady that I'd advertised it in haste and had sadly changed my mind. More emails came, I could have sold that carder at least 5 times. I had to start saying sorry it has sold even though I hate lying but having to explain over and over that I'd made a mistake was also too much for me to keep explaining. It has sat in the box on the shelf for another 8 months until today. One of my friends has just asked some advice about where to sell a few things, one of which was a drum carder. So realising that fibre mountain isn't going to shrink itself and also in need of something to spin, I got some of it out and have carded it. I think the reality is I am not that thrilled with the colours in the fibre mountain, but it will still make yarn. 3 whole days to D (Diagnosis) day! Unless you have gone through something like this you're not really going to understand how it is, and it's going to be different for everyone. So this Thursday morning I will be driving back into Ipswich and reading a report that the Dr assessing me will have written after chatting to me and asking me questions for 3hrs and 45minutes. It's hard to put into words how I feel about it all. I don't really feel like I've managed to speak enough about the things I struggle with. I even think the way I am in conversation means that when she has asked about something very important like food, I've started to say how I eat and the foods that I eat, but I've wandered off on yet another tangent halfway through and don't even think I've covered this area properly. In the famous words of Doris Day 'Que Se Ra, Se Ra. I am trying to just let it be. I'm trying to keep busy. Some days are easier than others. This morning I woke up early (5.20) and had a lovely run as the sky lightened. My pace right now is pretty hit and miss, but running is a kind of meditation for me so I need to keep going now more than ever and not worry about it. There have been a thousand and one thoughts rushing through my brain on a daily basis and mostly I'm just trying to keep busy. There's never a shortage of things to do around here, I've made a list to try and organise and pin down what needs doing, projects that I've started and a list of things that I want to do. 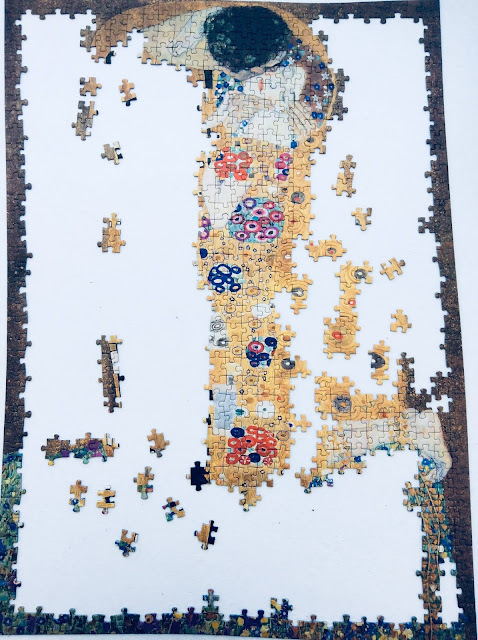 I think I started the puzzle (Klimt The Kiss) around the 10th of February. You either love a puzzle or you hate them. I find it a little bit magical, you're working on a section of border and you're convinced there must be pieces missing as things aren't matching up, 2 days later on closer investigation and with a little re arranging it magically works. I could stay there poring over puzzle pieces all day some days, but I don't, well if I need to I will, but you need to walk away and come back, usually that's when the piece you were looking for suddenly just materialises in the box you have looked through about 300 times already. What I'm really enjoying about this puzzle is the study of the finer details of a famous painting, things you may not notice unless you spend hours working out what a piece is and where it goes, anyway this puzzle still has a long way to go. Today I didn't write a plan, or a to do list. I thought a friend was going to visit, so I wasn't sure what we were going to do. I've already failed because it was suggested I write a timetable (which is a good idea) and I didn't, oops. So top of today's list, write a list, prepare some kind of a timetable for the rest of the week and tackle a job that is already in process. I've written it here now, that means I'm accountable I better go and do it! I'm just not sure what I want to achieve this week, apart from a positive diagnosis and that is out of my hands and beyond my control. Watch this space! A timeline..... I knew I was different at high school, I went to college for 4 years, I worked various jobs and through it all for a very long time I felt like I didn’t quite fit in. There were programmes shown on Channel 4, online tests....people say we’re all on the spectrum. A vague explanation for all my quirks and eccentricities. Fast forward to 2015 where my eldest started senior school and went through some ‘difficult stuff’ and eventually by 2016 I saw a 13 year old who reminded me of my 18 year old self. It was weird, I felt like I understood but still didn’t have a name for it. There was horrendous behaviour, challenging difficult stuff, meetings, referrals and a report from an educational psychologist. We moved house, things got worse instead of better, I got worse too. It was a slow trickle at first, like breadcrumbs through the forest, a trail I was following, clues, pieces of a bigger picture. I’m not quite sure when the eureka moment happened exactly (it was possibly July 2017, there are notes but I’ve had a giant of a day and just need to get this down). I was joining the dots, reading stuff online, what was ‘up’ with my teenager.... I started reading about Aspergers, teenagers with Aspergers....this then led on to how females with Aspergers are very different in some ways to males....some helpful women have blogs, and checklists and all the pieces start to fall into to place. I cry off an on for around 3 days....I tick a lot of boxes! What next....well you process the information, you think about things. You talk. By August I decided I had enough to speak to the dr about a diagnosis for me. There was a Referral. I think if it was just me and my husband diagnosis wouldn’t be as much of an issue, but it’s to validate who I am, there’s another younger child who sometimes has difficulties and traits, they may come to nothing, I have a better awareness now. People need to see and understand that autism has many faces. Last April there was a 2 hour ‘pre diagnosis’ meeting! Like a stressful job interview off you go to talk about yourself and your childhood, teenage years, work life, how things have been and hope to make it onto the waiting for assessment list. A nail biting week, wondering if I had said enough, finally after thinking about it over a weekend an email sent expressing a little anxiety that there was so much more...an email back saying I was going on the list. A sigh of relief! Quietly waiting, you understand yourself better, there are forums, other women, older women, different faces, similar stories, coming out of the shadows. So here I am, last Tuesday I received a letter to say I was at the top of that list, a bit of a surprise....and this morning I had the first of 3, 2 hour meetings. By March 7th there will hopefully be an answer. Here I am almost at the end of my journey of self discovery, except it won’t end, and today I had to consider a question, posed by the Dr assessing me, about what happens if I don’t get diagnosed. This feels like a giant thing...that I need the answer to, and that’s why I’m here to talk about it and reassure myself I’m going to be ok with it, either way. Let’s say this triad is 75 tick boxes, I’ve come this far....because there is something there, what if I only tick 74 boxes, no cigar, the computer says NO (thanks Clare) I’m still closer to the autistic end of the scale than I am neurotypical. Ok so what is normal anyway, I am still me, quirky, eccentric, clumsy, shy, misunderstood and easily confused. Back with news when I have something to say. Eggstra Eggstra....read all about it! So here we are in April and I've not managed a blog post since January! I do manage to surprise myself with my inconsistent blogging, but what does it matter really. The years do pass in a bit of a blur, I have to stop and think about what has happened so far! The main events in February being Maddox's 6th birthday, Elaine and Dave's wedding and a 90th Birthday Party. I managed to lose my bestest woven shawl, then found it the next day! 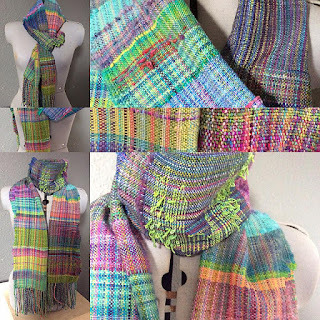 There was weaving, I made a really wide warp in fine cotton and wove yardage in Noro sekku! I'm hoping to turn it into some kind of tunic one day! I'm really pleased with how it turned out! April arrived! 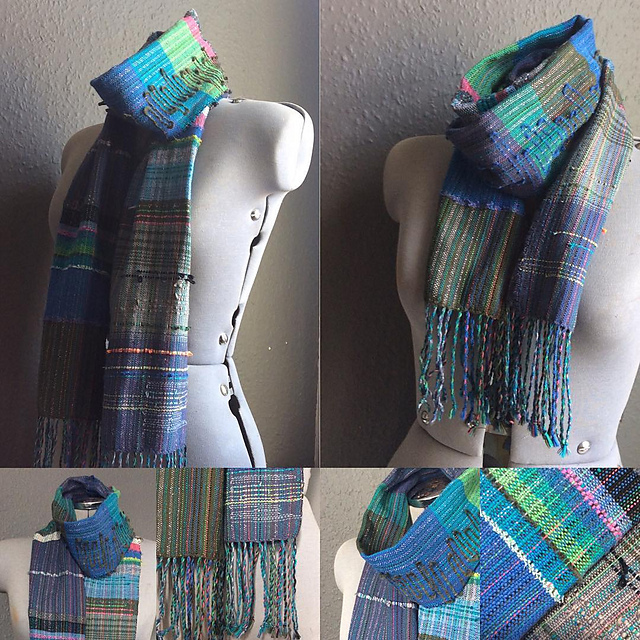 Not got much done as it's Easter holidays but I have managed to finish a sewing project for my sister which needed to be done and out the way, and I've finally cast on some knitting! 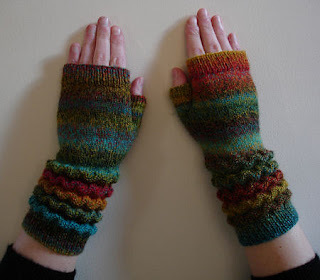 Only handwarmers, but a good park project for when Maddox is off playing! I'd been thinking of knitting some more anyway but when I checked Ravelry to see how long I had, had them I knitted them in December 2007, they did have a good life, didn't they! Trekking don't make this colourway any more or I could reknit a new one! I'm still finding a little time for spinning! I've just finished off some bfl I've been spinning for a couple of weeks, and there's always a little doodling going on in the background. I'm a 39 year old obsessive spinner, who lives on the south coast.